Hunger Exposed | Hunger exists in Iowa. Learn more & TAKE ACTION! Doing outreach at Goodwill on Sunday afternoon is always an interesting and inspiring experience. There is always a tag sale; today all clothing with a pink tag is 50% off. Although it is cold and blustery, by two o’clock I have visited with over 50 families, educating them about the benefits of food assistance and listening to a wide range of opinions on the subject. Did you know that if you live alone and make $10 an hour for a forty hour week that you are ineligible for food assistance by $43? Well $10 an hour is decent money but “Shirley” still finds herself deciding between buying food and paying the light bill, especially when the temperature is near zero for so many consecutive days. Thankfully, I can refer her to several good pantries nearby and encourage her to visit them. In the door comes “Julie” with a big smile for me because just two months ago when we met, she referred a friend whose disabled son is friends with her son, also on disability for a congenital brain disorder. Two months ago “Julie” shared that her family was doing fine with both parents working full time and their son receiving SSI benefits. Fast forward to today, when she reports that her husband has been diagnosed with cancer and will not be able to work for at least a year. He has been approved for Social Security Disability and only has to wait six months for that to begin. 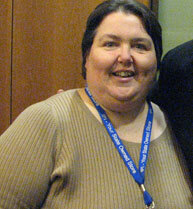 She is fortunate to have FMLA which allows her to take off work for his multiple hospital trips. But that is unpaid time off, of course, so she gratefully takes my information and will call me next week to get together to complete a SNAP application. Her cheerful demeanor inspires me, but she tells me of many years ago when they came home with a baby with a severe brain disorder and not much information and no internet to study and learn. She says those dark days have helped her with this diagnosis and she will find the strength to go on. And hopefully they will be approved for SNAP for as long as they need it, and that will remove even one small worry. The cold wind is blowing in more customers so I greet more customers with a warm smile. Oh, and I managed to move some merchandise from my table, too. We are all here to help, right? 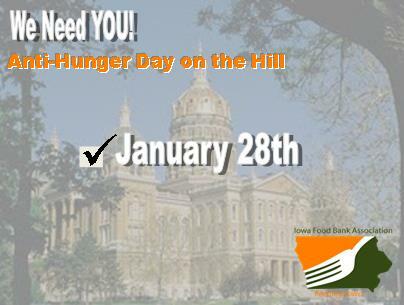 Wednesday, January 28th was the day of the Iowa Food Bank’s Association Day on the Hill. We had a great turnout for both advocates and legislators, and overall, the day was very successful. The morning breakfast in the rotunda was a great setting for legislators and advocates to talk. Everyone was able to discuss the problem of hunger without the pressures of scheduled meetings. As I was working the registration table for the beginning portion of the morning, I sincerely enjoyed getting to meet the advocates who came to support our cause. The legislators I was able to talk to (before I had to leave for class) were both enthusiastic and excited to speak to everyone. The afternoon was spent in meetings with leaders from the House and Senate, as well as the governor’s office. Senate and House leadership both seemed open to discussion but referenced the tight budget. Overall, the day was a great way to raise awareness about our legislative priorities this year. The direct interaction between constituents and their legislators certainly helped to gain a human element to our cause. Yes, hunger directly affects each of Iowa’s 99 counties, but sometimes it is easy to forget the people behind the cause, and instead focus on how tight the budget is or political differences. Bringing in people who are passionate about hunger and represent Iowa’s many food banks was a great way to remind legislators about just how many people are affected daily by hunger in Iowa. The Day on the Hill was also a great learning experience. Though I’ve taken classes about the legislative process, it’s certainly a different experience to see the process at work. I witnessed the importance of effective teamwork, and saw how great of a difference it can make. On a more personal note, I also learned how difficult it was to find parking at the Capitol in the afternoon. The Day on the Hill event was a great way to meet Iowa’s legislators and fellow hungers advocates, as well as learn more about how things run at the Capitol. We don’t always see what is happening in our own community. We are so busy with our daily lives that if we are not exposed to people outside our vision then maybe it doesn’t exist. It does exist. Hunger. In every part of this state. In every county. 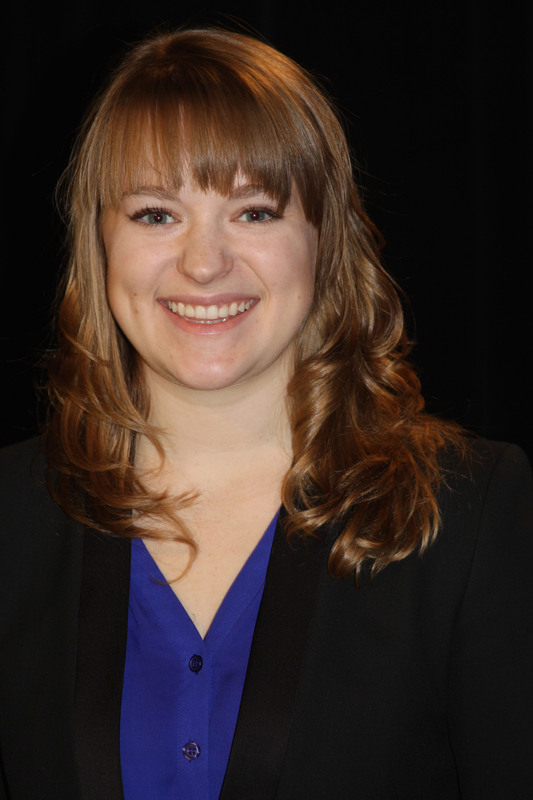 Three months ago I accepted the position of SNAP Outreach Coordinator with the Iowa Food Bank Association, covering half of Iowa – 50 counties. My passion to help others and to join a team of people who make a real difference brought me here. To actually be in the presence of hunger each day is an awakening. I see how much of a need there is in every community to help our neighbors with food insecurity. Each person has a unique story. I see young mothers working to provide for their kids, seniors barely making their income get them through the month and thankful for their next meal, disabled individuals struggling physically just to make it to the local pantry and so thankful for the box of food, and the homeless folks joining others for a community meal and surviving yet another day. I see each one and help as I can. It is so fulfilling to reach out and do this work. And there really are not enough hours in the day. If you could see what I see … I have truly found my place. Have you thought about being a volunteer? The Iowa Food Bank Association could use your help! If you are interested in becoming a SNAP Outreach Volunteer and assisting in the fight against hunger by helping individuals sign up for SNAP benefits, please contact me at 319-529-0566 or tlwinkey@iowafba.org. 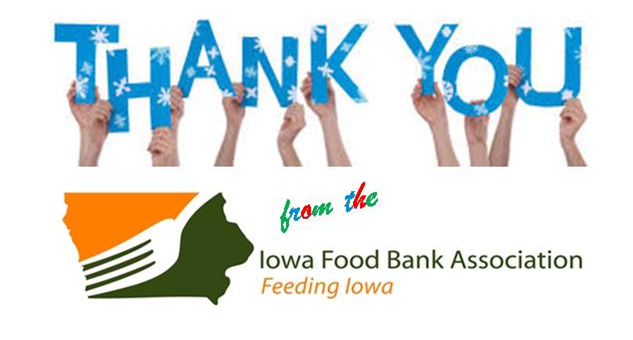 As we approach the holiday season, there is no better time than now to express our most sincere appreciation for all the feeding organizations, donors, volunteers, and advocates for their continuous support of our mission to alleviate hunger by collaborating with the eight Feeding America Food Banks serving Iowa. There are 389,730 hungry children, adults, and seniors in Iowa and it’s because of the combined work of everyone, we are able to provide hope and opportunities to our friends and neighbors. Throughout the past year, we have shared stories of success and stories of hope. We’ve profiled the lives of hungry families right here in our state and profiled the great work of our volunteers committed to serving those families who struggle with hunger. We’ve shared the tremendous support of our many partners who have offered monetary and in-kind donations to assist us in this fight. We’ve featured the unwavering commitment of food bank staff, emergency feeding organization staff, and advocates that have devoted many hours to bring food-security to our state. It is because of these individuals and those 389,730 friends and neighbors struggling with hunger that we continue to fight hunger in Iowa. It takes a special staff to coordinate such a comprehensive statewide hunger-relief effort so I’d like to take this opportunity to sincerely thank the whole IFBA team — a team that puts their whole heart into coordinating the effort. This holiday season, it’s appropriate for us to reflect on the many successes and give thanks to those who have made it possible. Please join us on December 11th for our open house as we celebrate our new Des Moines office location while thanking those how have joined us in the fight against hunger. Governor Terry Branstad is joining local milk companies and dairy farmers to bring attention to nutrition and hunger relief efforts in support of the Great American Milk Drive, the first ever national program to deliver highly desired and nutrient rich gallons of milk to hungry families who need it most. Event attendees had the opportunity to sample milk from local milk companies AE Dairy and Highland Dairy and learn how to get involved as Gov. Branstad and dairy industry representatives discuss the Healthiest State Initiative and the Great American Milk Drive, proclaiming June as “Dairy Month” in Iowa. Hunger impacts 1 in 8 Iowans and 12.5 million families nationwide. These families do not have access to adequate nourishment to help them reach their full potential. Hunger has no boundaries and is problem that exists in urban, suburban and rural communities. According to Feeding America, the nation’s largest hunger-relief organization, milk is one of the items most requested by food bank clients, yet there is a nationwide shortage because it is rarely donated. That can change with Iowa’s support of the Great American Milk Drive! Yesterday, Cory Berkenes, Director of the Iowa Food Bank Association had the opportunity to meet with the public and Gov. Branstad. He was also available for media interviews on how the Great American Milk Drive can impact Iowa’s eight Feeding America Food Banks. Many of Iowa’s food bank directors, including Barbara Prather and Sunni Keigebien of the Northeast Iowa Food Bank, were also in attendance. It’s been a challenge for Iowa’s food banks to meet the demand for milk due to the lack of donations- canned goods and other non-perishable grocery items are more likely to be donated. Now, it’s easier for Iowa’s residents to lend a hand and contribute nutritious milk to food insecure families! With the simple click of a mouse, (www.milklife.com/give) or text message (text “milk” to 80088), it is now possible to buy much needed milk and donate it for as little as $5.00 to family who does not have regular access to milk. By entering your zip code online, you can ensure that the milk is delivered for you to a local Feeding America food bank in your own community. The Great American Milk Drive is made possible by the nation’s dairy farmers and milk companies. The goal of the campaign is to deliver two million gallons of milk to food banks across the country, and Iowa residents can help meet that goal! Donations for milk can also be made locally by going to www.iowafooddrive.org. Approximately, 75% of the individuals accessing emergency food through food pantries, community kitchens and shelters are eligible for SNAP, but 25% of them have never applied (Hunger in America 2010, Feeding America). In order to address this gap, the North Liberty Community Pantry has partnered with the Iowa Food Bank Association to provide SNAP Outreach assistance on-site during select food pantry hours. This additional service allows pantry clients to sign-up for Food Assistance (formerly known as Food Stamps), at the pantry with the help of a trained volunteer. The North Liberty Community Pantry (NLCP) encourages families to shop for their own food as often as once per week. In 2006 we took a leap of faith and changed from distributing pre-sacked bags to providing a client-choice method of food distribution. Families choose what they need and there are few limits on more expensive, less available items such as meat and toiletries. The Pantry is a place where people come together and support one another. Community is built every day in the Pantry. The families we serve help each other, volunteers and families get to know each other, and the community becomes stronger as a whole. In 2013 the NLCP served 531 families who made 7521 visits to the Pantry. We distributed more than 240,000 pounds of food and toiletries. More than 9300 pieces of clothing including special distributions of coats and socks & underwear were also distributed to families we serve. During our annual family interview, 40% of families reported that the Pantry meets their needs for 2-3 meals per day – the NLCP is the primary food source for these families. We have 130 volunteers who dedicated more than 7700 hours of volunteer time in 2013. By providing SNAP Outreach as part of our pantry services we are helping families to become more financially independent. Furthermore, these benefits allow families to purchase foods to supplement what they receive from our pantry and are especially helpful for clients with dietary restrictions. By incorporating this new service within our pantry we are better able to serve our community. by raising awareness and showing support for seniors facing hunger in our country. Feeding America and its network of more than 200 food banks unite to bring attention to the issue of senior hunger and share ways for individuals to get involved to help solve it. Lack of access to food among seniors can cause severe health consequences. A recent study released jointly by Feeding America and the National Foundation to End Senior Hunger revealed that food insecurity in seniors is associated with a number of diseases and other negative health consequences, including depression, heart attacks, asthma and congestive heart failure. YOU CAN HELP! As individuals, charities, businesses and government, we all have a role to play in getting food to our neighbors in need. Join the Iowa Food Bank Association in the fight against senior hunger! To join our campaign, make a sign using a black marker and large font that says “#solve senior hunger.” Be creative. Use non traditional materials such as a pizza box, paper plate, brown paper lunch bag, or even a piece of recycled card board. Pose for a photo with a senior you know, while holding your #SolveSeniorHunger sign. Next, go to Facebook and search for the Iowa Food Bank Association and like our page. Also search for “Feeding America” and like our national organization’s page. Share your photo! Below are some sample posts you can use with your photo. Be sure to share it to the Iowa Food Bank Association’s wall! Senior hunger = higher risk for chronic health conditions. Help @FeedingAmerica #SolveSeniorHunger – post your senior photo to support! 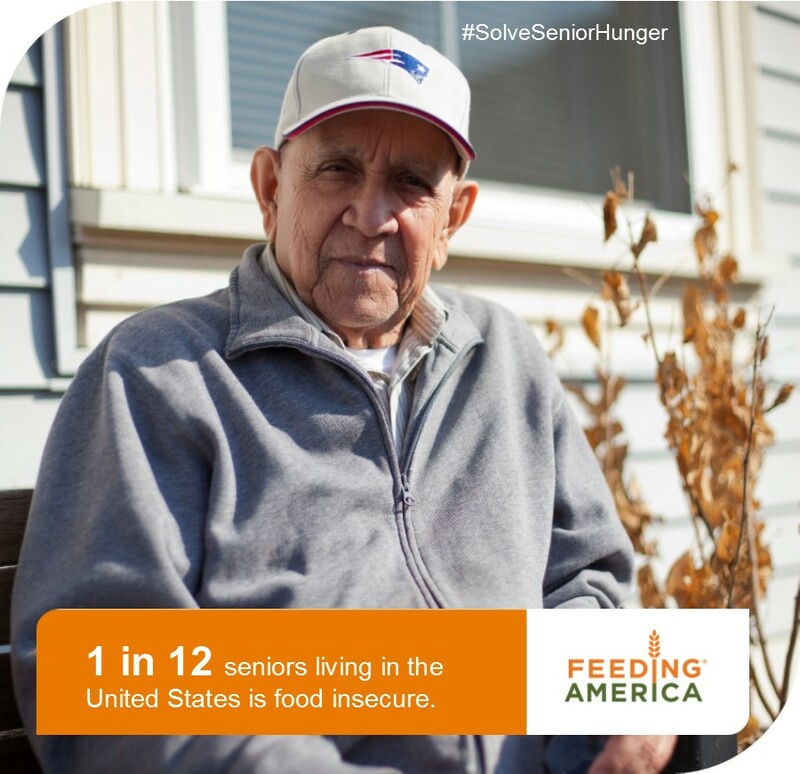 I’m helping #SolveSeniorHunger! JOIN ME and @FeedingAmerica by taking a pic with a senior you know to show your support. My [insert photo relation here, i.e. : husband, grandma or grandson] and I are helping to #SolveSeniorHunger by exposing the issue. Join us and @FeedingAmerica by taking a photo with a senior you know to show your support for over 4.8 million seniors facing hunger in America. posting your own photo with a senior you know to show your support and help #SolveSeniorHunger in America.